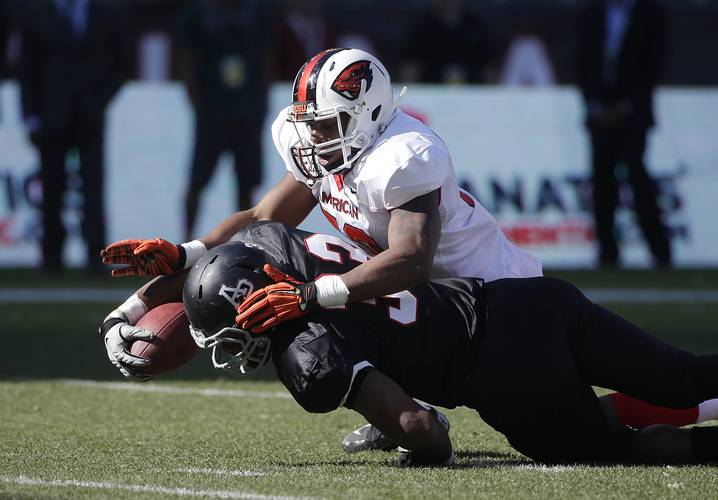 Terrell Watson from Azusa Pacific was voted the MVP of the NFLPA Bowl. The National Championship game was just last week and now we quickly transition to the end of season All-Star bowls. The first of the bowls was the NFLPA Bowl. This is a relatively new bowl that hasn’t caught on with a lot of fans. The players in this bowl are usually borderline draftable or undrafted free agents. With a good showing in this game, a player could get an invite to the Senior Bowl this coming weekend and really improve his draft stock. Jameill Showers-QB-UTEP (6-2 230): Transferred to UTEP from Texas A&M after losing the starting spot to Johnny Manziel. Good release and throws in rhythm. Does a good job reading defenses and taking what they are giving. Has good anticipation and instincts. Moves well in the pocket and keeps his eyes downfield when scrambling. Completed 3 of 9 for 29 yards and ran the ball 4 times for 16 yards. Brandon Bridge-QB-South Alabama (6-5, 235): Great body size. Originally from Canada, so he may be behind in terms of understanding the game. Has difficulty reading the defense. Very strong arm and surprising mobility. Tends to get sloppy with his mechanics and needs to be more consistent. Needs some time to develop. Completed 3 of 5 for 51 yards and had 1 carry for 9 yards. Andrew Hendrix-QB-Miami Ohio (6-2, 221): High football IQ. Does a good job eluding the rush and extending plays. Completed 4 of 9 for 47 yards. Had 1 carry for 3 yards. Rakeem Cato-QB-Marshall (6-1, 176): Slight frame and there is concern about his ability to take a hit in the NFL. Very good mobility. At his best when plays break down and he is able to improvise. Very competitive. Able to juke defenders in space. Completed 5 of 10 for 31 yards and had 15 yards rushing on 4 carries. Jerry Lovelocke-QB-Prairie View (6-5, 200): Long and lean. Strong arm. Can struggle with accuracy. Needs work on his timing and ball location. Completed 5 of 10 for 40 yards and had 1 carry for 3 yards. Cole Stoudt-QB-Clemson (6-4, 210): NFL bloodlines. His dad was former Steelers QB Cliff Stoudt. Looks polished, but lacks great arm strength. Completion percentage goes down on longer throws. Sat for three years behind Tajh Boyd then split time as the starter his senior year. Had the best game of any of the American team QB’s, completing 7 of 8 for 48 yards. Malcolm Agnew-RB-Southern Illinois (5-9, 207): Good burst through the hole. Bounces off tackles. Makes sharp cuts. Runs behind his pads. Had 53 yards rushing on 8 carries. Jahwan Edwards-RB-Ball State (5-10, 219): Very productive career with 3 straight years over 1,000 yards rushing. Able to start inside and bounce to the sideline. Good balance. Makes quick cuts. Spins out of tackles. Had 6 carries for 9 yards. Had 1 catch for 3 yards and also dropped a pass. Terrell Watson-RB-Azusa Pacific (6-1, 239): Does Azusa Pacific ever have small backs? This is the same school that produced Christian Okoye. Gives good effort and runs with determination. Has good moves for a big man. Makes nice cutbacks. Good special teamer. Led the National team in rushing with 55 yards on 9 carries. Voted the game MVP. Ross Scheuerman-RB-Lafayette (6-1, 205): Very good top end speed. Great hands. Could possibly convert to slot receiver at the next level. Better on the edge and in space. Had 4 carries for 28 yards and had a 51 yard run negated by penalty. Marcus Murphy-RB-Missouri (5-9, 195): Doesn’t run well between the tackles, but he is special in space. Won’t be an every down back in the NFL, but he could be a 3rd down back and returner. Led the American team in rushing with 3 carries for 47 yards and had a 43 yard run. Prince-Tyson Gulley-RB-Syracuse (5-8, 193): Quick feet. Good vision. Good outlet receiver. Good burst through the hole. Able to start inside and bounce to the outside. Able to hurdle defenders. Had 5 carries for 11 yards and 2 catches for 15 yards. Joe Bergeron-RB-Texas A&M-Commerce (6-0, 235): Very talented, but was suspended by both the University of Texas and Texas A&M-Commerce. Very tough, physical runner. Runs with determination. Good hands coming out of the backfield. Could also play fullback if needed. Had only 2 carries for -1 yard. Paul Laskie-FB-BYU (5-11, 232): Good hands. Tough player that used to play rugby. Physical blocker. Former walk-on. Had 2 catches for 1 yard. Chris Conley-WR-Georgia (6-3 205 lbs. ): Great combination of size and speed. Very good on vertical routes, but needs some work on underneath routes. Averaged more than 18 yards per catch for the season. Playmaker. Good hands. Led the National team with 2 catches for 45 yards. DeAndre Carter-WR-Sacramento State (5-9, 185 lbs. ): Small body type that is a prototypical slot receiver. Has a sudden change of direction. Natural receiver. Has ability to return kicks. Had a good week of practice, but had limited action in the game due to knee injury early in the game. Lucky Whitehead-WR-Florida Atlantic (5-10, 163): Small and quick. Versatile player that can also be used in the running game and returning punts. Snatches the ball from the air. Nick Harwell-WR-Kansas (6-1, 193): Good hands. Does a good job on low balls. Gives up his body. Had 2 catches for 15 yards. Demarco Robinson-WR-Kentucky (5-10, 158): Doesn’t have great size, but has quick moves in space. Adjusts well to the ball in the air. Returned two punts for an 18.5 yard average. Needs to put on some weight or he will likely just be a returner at the next level. Mario Alford-WR-West Virginia (5-9, 177): Good speed. Able to return kicks. Was held without a catch. Kaelin Clay-WR-Utah (5-10, 193): Good return man. Tough to bring down in space. Had 1 catch for 5 yards and had a 17 yard punt return. Anthony Johnson-WR-West Texas A&M (6-1, 194): Good size. Makes the tough catch and gets good yardage after the catch. Good concentration. Competes for the ball in the air. Led the American team with 3 catches for 40 yards. Devin Mahina-TE-BYU (6-6, 251): Great size. Good athleticism. Soft hands. Uses his big body to shield off defenders. Had 2 catches for 20 yards. Corey Simmons-TE-Northwestern State (6-4, 245): Physical blocker and runs with determination after the catch. NFL bloodlines, son of former NFL defensive end Clyde Simmons. Had 1 catch for 19 yards. Westlee Tonga-TE-Utah (6-4, 244): Soft hands. Runs good underneath routes. Had 2 catches for 13 yards. Brian Vogler-TE-Alabama (6-7, 263): Overlooked as a receiver at Alabama, but had a good week. Finds open spots in the defense. Soft hands. Has nice moves after the catch. At his best as an in-line blocker, but showed he has the ability to contribute in the passing game. Had 2 catches for 21 yards. Cole Manhart–OT-Nebraska-Kearney (6-4, 305): Does a good job setting the edge on outside runs. Plays to the whistle. Called for a false start penalty. Tom Farniok-G-Iowa State (6-3, 300): Versatile player that has played both guard and center. Concentrated on guard in this game. Jarvis Harrison-G-Texas A&M (6-4, 344): Massive player that has played left guard and left tackle. Likely lacks the athleticism to play tackle and will be a better fit on the inside. Able to get outside on the screen. Road grader that can be a dominant run blocker. Marcus Rush-DE-Michigan State (6-2, 243): Doesn’t have great size but has a high motor. Uses his hands well and plays with good leverage. Had a sack. Diaheem Watkins, DE, UAB (6-3, 256): Good speed rush. Had a strip of the quarterback. Andrew Hudson, DE, Washington (6-2, 250): Disruptive. Knows how to pressure the quarterback. Had a sack. Zack Wagenmann-DE-Montana (6-3, 247): Productive pass rusher. Gives great effort. Plays with his hair on fire. Has good bend and dip technique on pass rush. Chuka Ndulue-DT-Oklahoma (6-2, 288): Gets good inside push. Recovered a fumble. Jabral Johnson-LB-Oregon State (6-0, 224): Three down linebacker. Able to drop into coverage. Knows how to get into passing lanes and be disruptive. Michael Doctor-LB-Oregon State (5-11, 221): Lacks great size, but he always seems to be around the ball. Good speed. Good special teams player. Big hitter. J.R. Tavai-LB-USC (6-1, 248): Takes on blocks and can fight through the blocker to make the tackle. Does a good job playing containment. Had a tackle for loss. Cody Riggs-CB-Notre Dame (5-9, 186): Transfer from Florida. Versatile player that has played both corner and safety. Good instincts. Doesn’t have great speed, so his best position may be safety. Jimmy Jean-CB-UAB (6-2, 201): Great size. Closes quickly on the ball when it’s in the air. Uses good technique to knock the ball away. De’Ante Saunders-CB-Tennessee State (5-9, 185): Good deep coverage. Does a good job mirroring the receiver. Come back tomorrow when I will discuss the East – West Shrine game. Next Wednesday I will be discussing the Senior Bowl. If you like what you read, like us on Facebook and tell your friends. This entry was posted on January 22, 2015 by draftmaniacs in All-Star Games and Combine and tagged 2015 NFL draft, Andrew Hendrix, Andrew Hudson, Anthony Johnson, Brandon Bridge, Brian Vogler, Chris Conley, Chuka Ndulue, Cody Riggs, Cole Manhart, Cole Stoudt, Corey Simmons, DeAndre Carter, De’Ante Saunders, Demarco Robinson, Devin Mahina, Diaheem Watkins, J.R. Tavai, Jabral Johnson, Jahwan Edwards, Jameill Showers, Jarvis Harrison, Jerry Lovelocke, Jimmy Jean, Joe Bergeron, Kaelin Clay, Lucky Whitehead, Malcolm Agnew, Marcus Murphy, Marcus Rush, Mario Alford, Michael Doctor, NFL, NFL Draft, NFLPA Bowl, Nick Harwell, Paul Lasike, Prince-Tyson Gulley, Rakeem Cato, Ross Scheuerman, Terrell Watson, Tom Farniok, Westlee Tonga, Zack Wagenmann.